Darrell McElroy said recent media reports and product recalls after people were sickened by E.coli- contaminated flour are a wakeup call for farmers. He said it’s an example of how foods or food ingredients that aren’t exposed to heat before being eaten can harbour harmful organisms. Hemp seed is a food product that receives minimal processing and no exposure to a “kill zone” before consumption, but other crops such as flax are also at risk, he told farmers attending the recent Organic Alberta conference in Red Deer, Alberta. Fresh Hemp Foods uses certified trucking services and conducts testing before accepting loads into its facilities. It routinely rejects loads that either test positive for bacteria or which contains suspicious debris such as fertilizer pellets, bird droppings, feathers or evidence of rodents or mould. “There is no way we’re going to take a risk of making anybody sick,” McElroy said. He cited examples in which all of the above were found in loads farmers were trying to sell to his plant, loads that were turned away at major expense to the farmer. If a processor rejects a B-train load of hemp, the farmer is out approximately $90,000 at current prices. Alternative outlets for loads rejected by a food processor include the bird food market or as livestock feed, both of which generate much lower returns. McElroy advised farmers to consider a simple assessment before moving edible commodities off their farms. “What we’re talking about basically is giving it to your kids and grandkids to eat,” he said. The test may be simple, but ensuring the threat of contamination is reduced or eliminated is a complex task that involves considering how that product is managed at every stage from the field to the bin to the truck, he said. If using a bucket, make sure it’s clean. It can even be rinsed out with alcohol to be sure. When collecting a sample, make sure your hands are clean. If using a plastic sample bag, avoid blowing into it to spread the plastic sides, he said. Dedicate a clean shovel to bin work; avoid using one that might have come into contact with livestock, manure, treated seed or granular fertilizer. Make sure your boots are clean before entering a bin, he said. Footware can be contaminated from walking across the yard where there have been animals droppings. Check combine hoppers, truck boxes, augers and auger hoppers for evidence of moisture, fungus or mould before using them to move grain. Run augers before adding grain to ensure there are no bird’s nests, rodents or squirrels trapped inside. Check bins for evidence of rodents — especially flat-bottomed bins. Ensure the top hatches are closed and secured with no birds have been trapped inside. 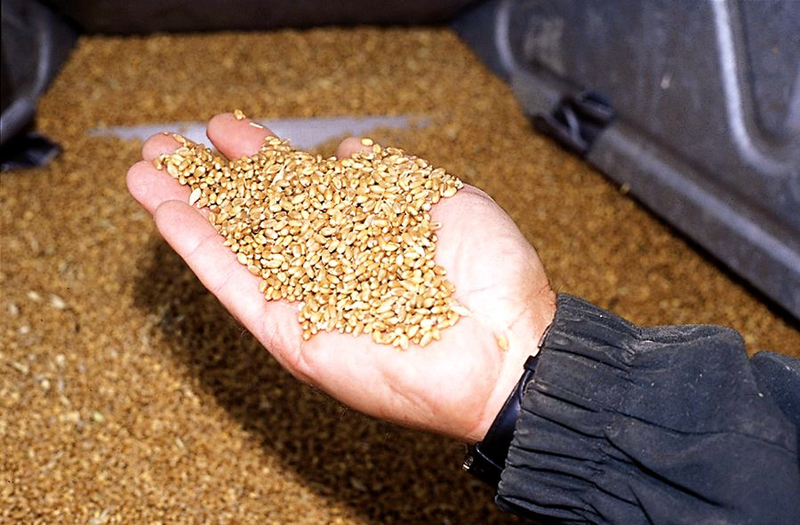 Pay attention in the field to ensure grain isn’t contaminated by something collected during harvest. It’s a difficult transition for farmers accustomed to viewing what they grow as commodities rather than edible foods. “It’s a whole different mentality,” he said. In one instance, the farmer absent-mindedly dumped the dead mice out of the bucket before he poured a sample of grain into it, only realizing what he’d done in hindsight — after the buyer had rejected the load.